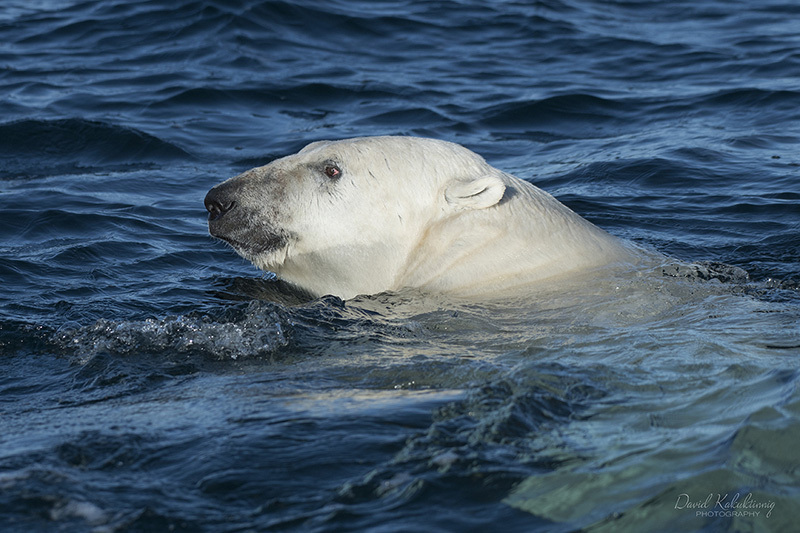 Taken this past summer, we came across this guy swimming in the Hudson Bay about 2 kilometers off-shore and heading to mainland. This was a huge healthy bear that gave us a great display of it's size when it lunged itself high out of the water to take a better look at us which was unfortunately a shot I had missed. Welcome to Naturescapes and the Wildlife gallery, David! What a thrill this must have been to see one of these magnificent creatures swimming strongly offshore. A very nice first post and I look forward to seeing more from you! We don’t see many swimming shots like this, David. The disturbed water gives the feeling of action, and the look of determination on the bear’s face says it all. Good job! Wonderful animal, you were very fortunate to have this opportunity to photograph him. I like the crisp lighting and clear water....beautiful. Beautiful image-you can just sense the power and determination of this magnificent animal. The deep blue water is a wonderful complementary color. Nice work!